Boss Man’s note: Euro Tour. Week #4. There was plenty of action around Europe on the weekend: While the big one was in Bilbao there were also great races happening in Oslo, the UK, France, Austria and the Netherlands. The race in the Netherlands was the Battle of the Coast, the country’s biggest beach race and this year the Dutch National Championship event as well. That meant a spot on Team Netherlands (or is it Team Holland? Seriously, which one is it?) 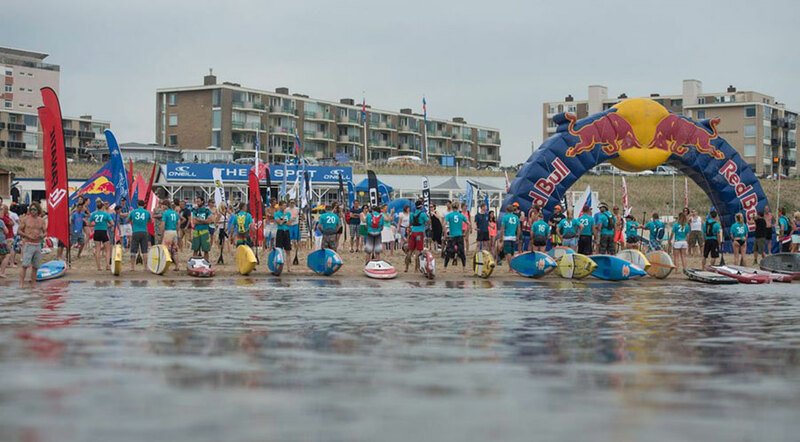 for the 2015 ISA Worlds was up for grabs. Check out the recap below thanks to our roving reporter and all round adventure SUP pioneer, Bart de Zwart. 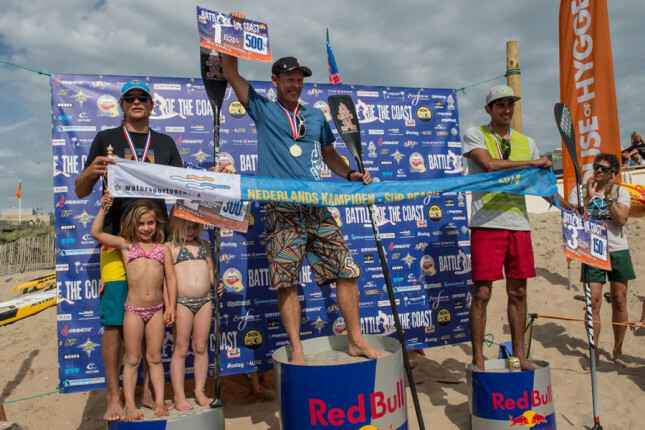 This year the Battle of the Coast was a two-race event: First there was a short technical course inside Haarlem, while Saturday was the main beach race, which is Holland’s biggest race of this kind and also a qualifier for the ISA World Championship in 2015. I arrived in Holland in the morning with the first race starting that evening. Even with a one day stop in London I still had some jet lag in my system and a slight cold too. I felt kind of fit but knew I would still feel my crossing from two weeks ago if I pushed myself too hard, so I just hoped for the best and my inner drive to kick in. (note: Bart did a 350km, unsupported ocean crossing in Tahiti a couple of weeks back). I was using a Starboard All Star (12’6 x 25.5″). I tried the Sprint model just before the race, however with so many buoy turns and waves bouncing off the walls, I felt more comfortable using the All Star and its wider tail. The race had qualifying heats to get into the final. The first heat went fine: The start was OK but Ricardo Haverschmidt has been training hard lately and it clearly paid off. He was faster than me out of the blocks right up until the first buoy, where I just had enough room to get inside for a tight turn that gave me a lead. Another tight turn around the second buoy and the lead grew. My Starboard team mate Ike Frans caught up to Ricardo at the third buoy and – the All Stars were fast right up to the buoy and, thanks to their wider tail, were very easy to step back and turn on a dime. In the final my long time friend Martijn van Deth also joined us from the other qualifying heat. My start was better this time and I held the lead to the first buoy, only to make a mistake and let the strong paddling Martijn through on the inside. The rest of us piled up and although I held onto second, Martijn kept making tight turns at every buoy and I had to work just to keep up, but could never overtake. On Saturday it was the beach race. There were more points available for the overall Battle of the Coast title, plus there were the all important ISA Worlds qualifying places up for grabs. 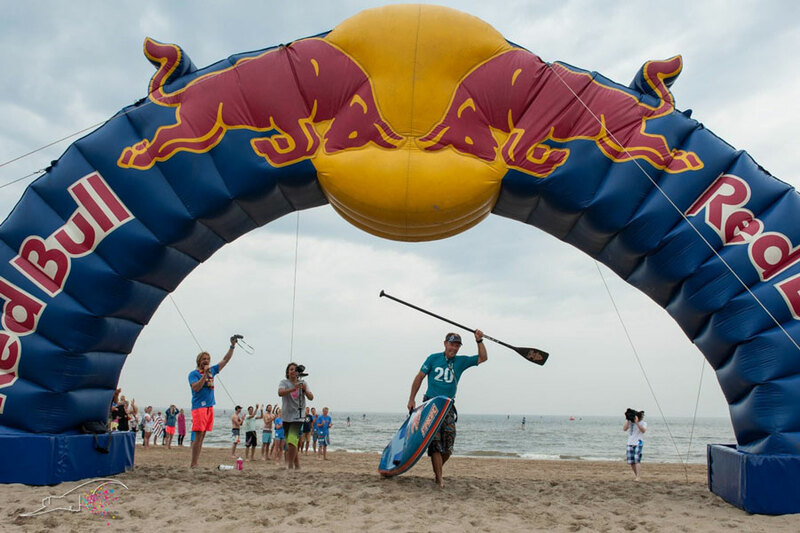 It was a five-lap technical course with six buoys and a beach run every lap. A tough 12km course. 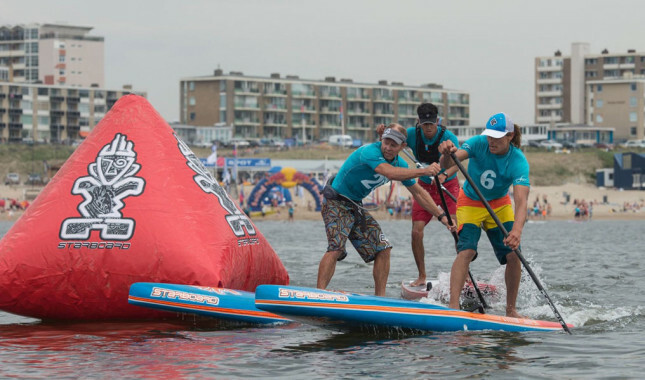 The start was a Le Mans style, as used in Jamie Mitchell’s “Survivor” race: Start near the water next to your board, run up the beach and grab your paddle, then run back to your board and into the water. I got a good running start, as did Ricardo and Martijn. 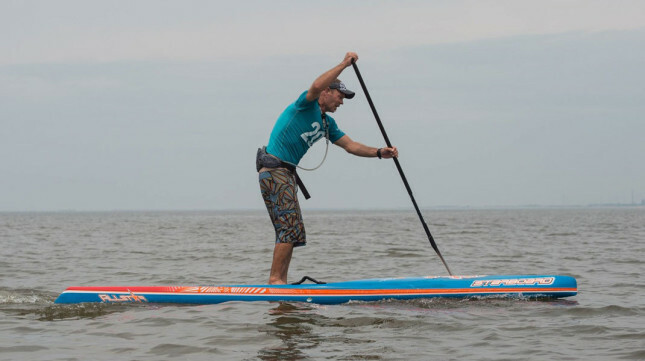 However Martijn fell on his board and broke his paddle, which is a very tough way to go out of a race, especially considering this was an ISA qualifier. As we headed out to the first buoy, I took the lead with Ricardo coming up alongside me and Ike following close behind. The conditions were pretty flat which made the race very close. I reached the first buoy with a nice little lead, while Ike overtook Ricardo and came up right behind me. We knew Ricardo is a very good runner, so Ike and I needed a little lead every lap to ensure he didn’t catch us on the soft sand run between each lap. After we completed the first lap (about 15 minutes), the three of us were very close after Ricardo caught us on the run, however that didn’t last long and soon it was a race between Ike and myself. Ike looked strong and I was feeling my body aching. At the end of the 2nd lap, Ike overtook me but I was still able to follow him and keep the same pace. There was still a long way to go in the race, so I planned to just hang in there and attack again on the 4th lap. However it didn’t come that far: Just before we got to the beach again, Ike went for the wrong buoy. I tried to warm him but he was so focused he didn’t realise until it was too late. By the time he realised his mistake he backtracked and got back on course. We had such a lead on the rest of the field that Ike did enough to get back on course in third position and ended up in a battle with Ricardo for 2nd until the finish. Ike’s mistake gave me a big lead, so I just held my own pace at the front. After 1 hour 15 minutes I finished in 1st, with Ike only a couple of minutes behind after working hard to break Ricardo. A big bravo to Ike who worked really hard and fought his way back into the race after his mistake. 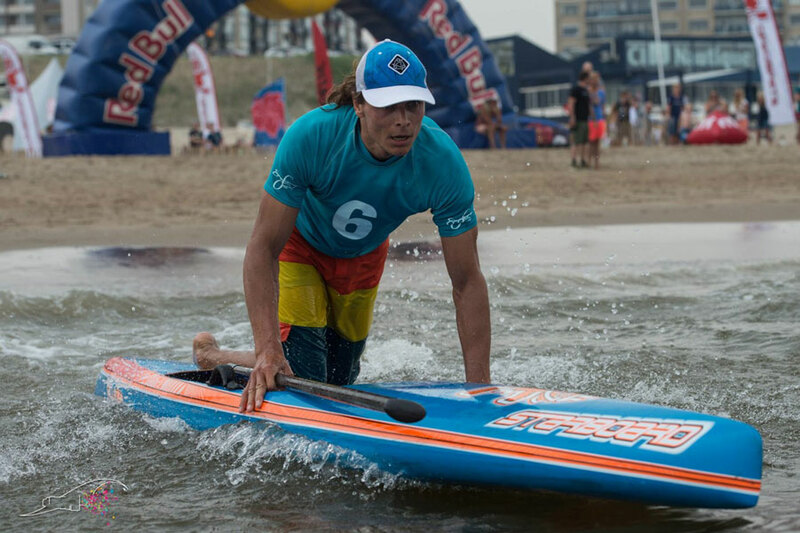 So now I am very happy to say I will represent the Netherlands at the ISA World StandUp Paddle and Paddleboard Championship in 2015. This was the first year my home country had been organised to select a team for the Worlds. Up until now the ISA affiliate in the Netherlands wasn’t organised or wasn’t interested. However now the team is organised through KNWV, the same organisation behind the Dutch Olympic sailing delegation. So in the future I believe the Dutch will be well represented at the ISA Worlds and I look forward to being in the first ever team.